The Doctor Blake Mysteries is an Australian period drama TV series that is simply brilliant. Sorry – I meant BRILLIANT! But instead of trying to out sass Phryne (I’m not sure anyone can do that – but give him a pair of fishnets and I bet Craig McLachlan (who plays Dr Lucien Blake in this series) would give it a go! 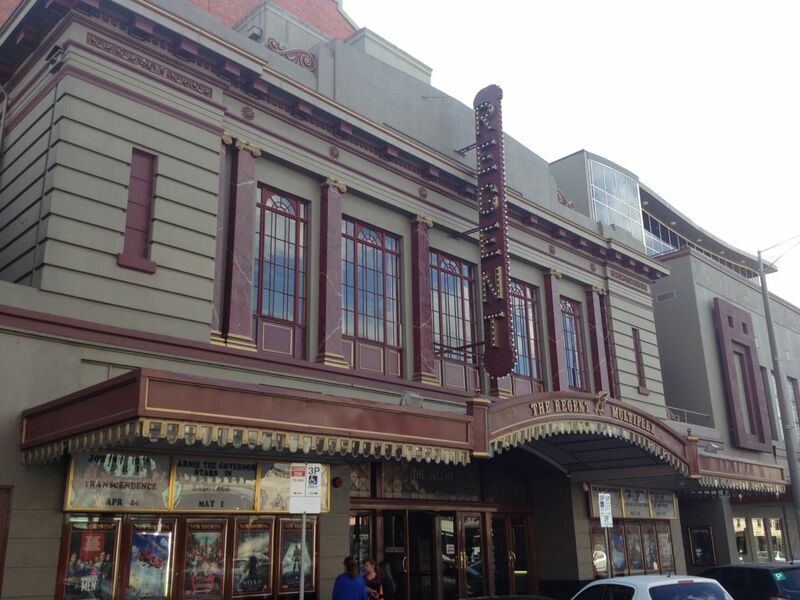 ), The Doctor Blake Mysteries are set in the bleak post war period of 1950’s Ballarat. Fans like Stephen and myself have been drawn in by the haunting music of the opening titles composed by Dale Cornelius (see more on his YouTube page), the sublime casting, wonderful plots and character threads, and great production of this award-winning series. The deliberate fading of colour in post production does take a bit of getting used to, but it’s done to reinforce the post war feeling of the era (I think). The best news recently is that season three is going to be shot by the end of 2014 and – somewhat amazingly – the show’s official Facebook page was even saying that it could be airing by February 2015! Woohoo!! From 1 May to 9 June this year, M.A.D.E. 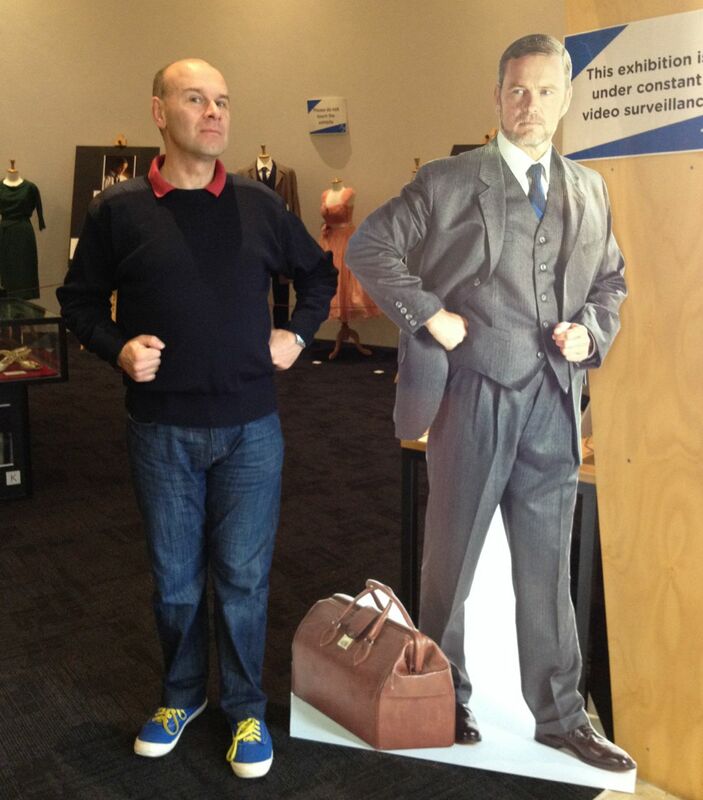 (Museum of Australian Democracy at Eureka) in Ballarat hosted The Doctor Blake Mysteries costume exhibition. Since Ballarat is only a 1.5hr drive (these days! It would have been much longer for Dr Blake) from Melbourne, and Ballarat is a great place to visit, we thought it was definitely worth going, especially since we hadn’t visited MADE before. 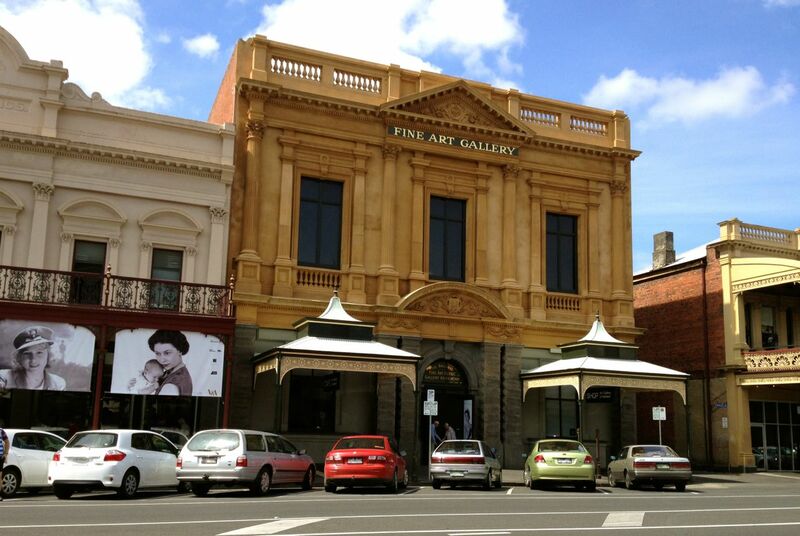 First port of call was The Design Exchange market in the glorious old Mining Exchange building on Lydiard Street. Definitely worth a stop if you’re visiting on a Sunday. The only downside for Stephen was that there wasn’t much in the way of menswear to browse, whilst I on the other hand, managed to pick up two items of clothing. Not bad for someone who doesn’t usually like clothes shopping! There’s also plenty of funky handmade craft items to browse. 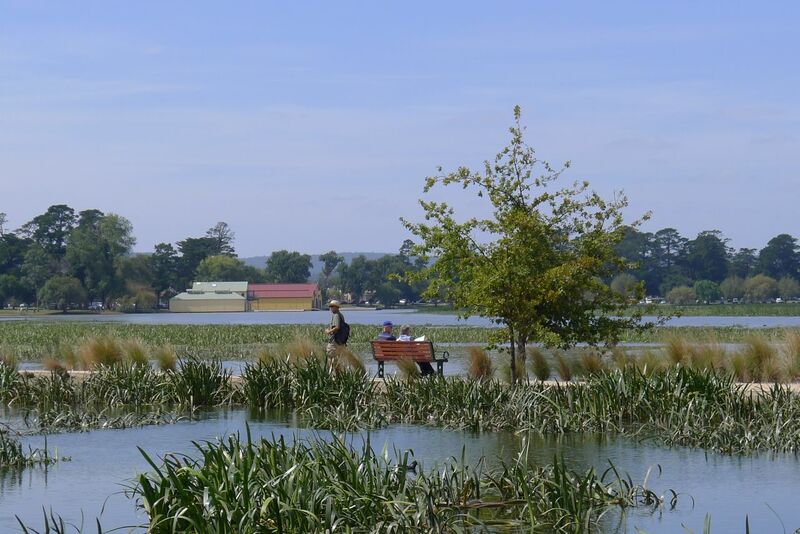 After a quick drive around Lake Wendouree – no trip to Ballarat is complete without a drive around the lake to check the water level, see the birds, and admire some of the houses, old and new, but all with great views – we headed off to M.A.D.E.! Located just outside the centre of town at the physical site of the Eureka Stockade, M.A.D.E. uses the history of the site to encourage visitors to explore concepts of democracy. As it opened fairly recently (May 2013) there’s no excuse for children and adults alike to visit and learn something new. I thought the lecture theatre was also very comfortable and inviting. Emergency Assembly Point in front of the toy soldiers at the kids play area – somewhat ironic? It didn’t feel like there was as extensive a collection as was set out in the Rippon Lea mansion for the Miss Fisher exhibition (see here), but it could be that there just aren’t as many costume changes in Doctor Blake as in Miss Fisher. Gorgeous furs and ostrich feathers went out the window in these lean post-WWII times, and synthetics were now in – although there are still a lot of cotton items in the collection, and the suits are wool, of course. The exhibition space was also unrelated to the series – maybe if it was being displayed in the house they use as Dr Blake’s residence in the show there would have been more opportunity for costume and prop displays. But it’s possible that someone may actually live there – I don’t know. Before taking photos I did check for any signs indicating that photography, even on my phone (which, incidentally, was what I was using) was not allowed, but saw nothing. No mention was made at the front desk about photography (or its prohibition) when we enquired about the exhibition, so I don’t think I’m breaking any rules in sharing this with you. I have titled the full-shot photos as per the display descriptions, and certainly tried to photograph everything on display. Due to guide ropes and glass cases keeping visitor from getting too close to the costumes and props (which is completely understandable), indoor lighting and not taking my proper camera, some of the photos are not quite as good as I’d hoped. So there you have it. 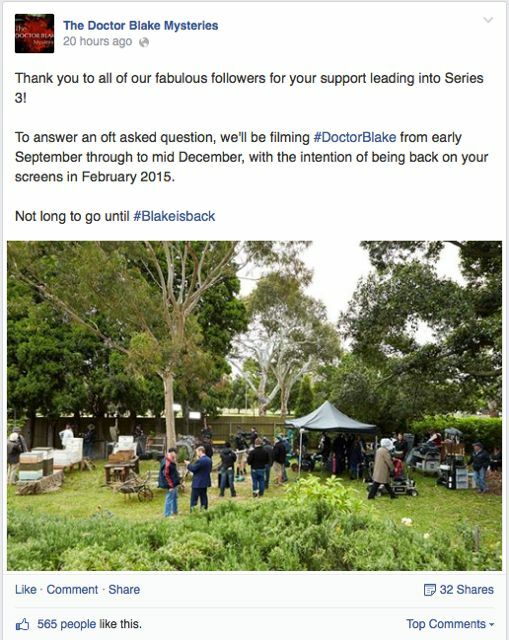 May season 3 be every bit as good as the past two seasons have been, and may there be plenty more Doctor Blake goodness to come! Categories: Victoria, Weekend Drives, Who Knows What | Tags: 1950's costumes, Art Gallery of Ballarat, Ballarat, costume, Craig McLachlan, Doctor Blake, Dr Blake, Eureka, exhibition, Lake Wendouree, M.A.D.E., MADE, Mining Exchange Ballarat, Museum of Australian Democracy at Eureka, Regent Theatre Ballarat, The Design Exchange, The Doctor Blake Mysteries, vintage costumes | Permalink. Did you know that not only has the Miss Fisher’s Murder Mysteries exhibition at Rippon Lea Estate been extended to 1 December 2013 (due to popular demand) but also that photography is now permitted?! Well, WE didn’t! At least, not until we looked it up today (for the first part) and not until we arrived there (for the second part)!! To explain, my younger sister and her fiancé are visiting from interstate for the weekend and, having seen my previous post on Rippon Lea and being a Miss Fisher fan, asked if we could visit Rippon Lea today. Had I but known photography was now allowed we would definitely have taken proper cameras – instead, these are pics from Stephen and my iPhones. Apologies for the quality, but I hope you enjoy them all the same if you are unable to attend the exhibition for yourself. Jane wears this in the Christmas special…doesn’t she? Categories: Photography, Who Knows What | Tags: 1920's, ABC TV, costumes, Essie Davis, exhibition, fashion, hats, jewellery, Melbourne, Miss Fisher's Murder Mysteries, National Trust, Phryne, Rippon Lea Estate, Ripponlea | Permalink.